I come across so many amazing small moments when I read other blogs that I’ve often wanted to find a way to collect them and share them with you. I am so inspired by those who truly cherish the small moments in life. I believe that we all want to appreciate those moments, we just need to slow down enough to see them. Beginning this Saturday, I will choose a few posts to highlight each week that capture a small moment. I’m calling this new feature Small Moments Spotlight. If you stumble across a post that captures a small moment, or if you’ve written one yourself, please use my “contact me” tab (it’s over there on the left under “site links”) and send me the link. 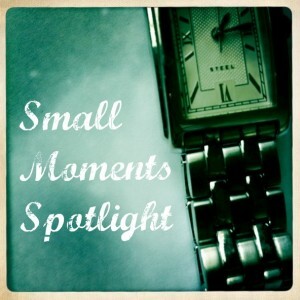 And if I feature you on Small Moments Spotlight and you’d like to have a badge for your site, just let me know! Small Moments Mondays aren’t going anywhere; there is just so much more that I want to share with you. 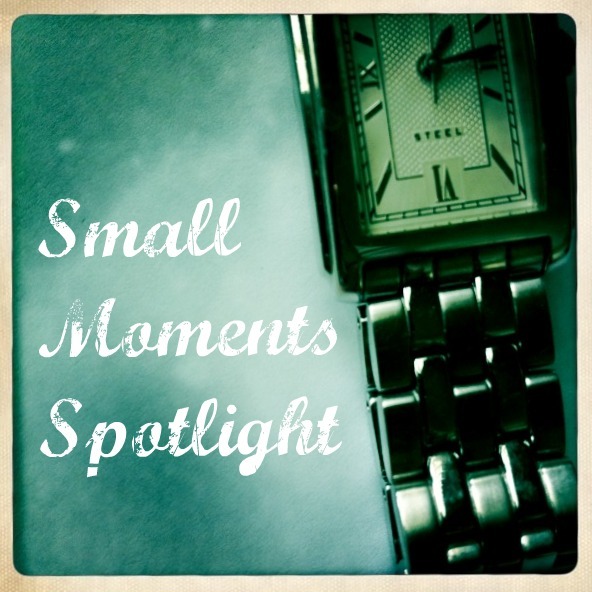 I’ll be back on Saturday with my first handful of posts for Small Moments Spotlight! There you go again, you lovely woman, sharing the love. So glad you're doing this and looking forward to your first post! I am really exited about this!! Great idea, Nichole. Ilove the badge. Great idea! Wonderful idea! I will have to step up my writing to even be in the running, because there are so many amazing writers that visit you on a regular basis! OOOH I already love this idea.. There is so much about the little things that we lose in between the big things. Brilliant, dear one. Just brilliant. What a wonderful idea! Looking forward to it. Wonderful idea, my friend! And I love your button/badge thingie, too…..so peaceful looking. This sounds awesome – count me excited! I'll be looking forward to Saturday! Like you don't have enough to do? But of course I will visit each and every Saturday. A small moment seems more manageable than that grand verbose meme of a Red Dress Society this week … Good Lord! What a great idea! I found your blog at Red Dress Club, and I'm so glad I stopped by. This is a beautiful blog! A very fun idea. Stopping by from RDC. Testament. In the absence of marketing materials let’s start by quoting the back label.